SOUTH CHICAGO — Raccoons terrorizing a South Side block since June — leaving at least one kitten dead — are multiplying. And neighbors say they are fed up that the city isn't helping them. 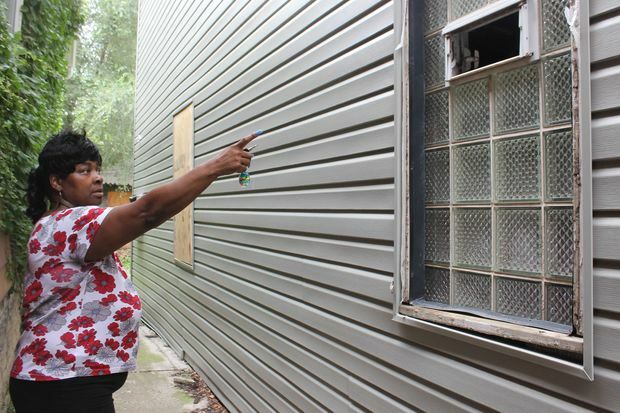 On Wednesday, hours after DNAinfo publicized the neighbors' complaints, city officials arrived to inspect a long-vacant house on 8300 South Saginaw Avenue that nearby residents say has become home to a family of raccoons. The house will be secured within the next day, said Chicago Department of Buildings spokeswoman Mimi Simon. Most of the windows were boarded up last week in response to a complaint, but an open window remained. Department of Buildings inspected the property at 8320 S. Saginaw for the second time Wednesday afternoon. "[It's] vacant and secure, except for the second floor rear window, which we will have secured within 24 hours," Simon said, adding that there's an active Circuit Court demolition case for the property. The court date has been set for Oct. 4. The raccoons showed up in June, resident Theo Daniels said earlier this month. And despite the death of a neighbor's cat and multiple calls to 311 and the alderman, the problem is getting worse. “The raccoons are coming out in the day now, they’re in herds,” said Theo's mother Diane Daniels, adding that she puts bricks on top of the trash cans to prevent them from eating the garbage. Diane Daniels said the raccoons have "expanded their territory" from the abandoned house to a home across the street, and that the block's squirrels and cats have vanished. Neighbors said they have called Ald. 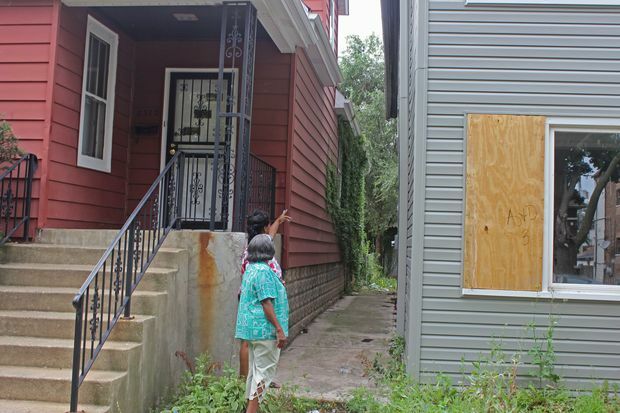 Greg Mitchell's 7th Ward office, the city's Animal Care and Control Department and 311 to report the situation, but were told that nothing could be done if the animals are not "vicious." "If they attacked the neighbor's cat, who knows what they'll attack next," Theo Daniels said. "God forbid with school starting soon, we have children that will be walking nearby." Owners of the abandoned house have been ticketed for building violations, though the situation remains unresolved. “311 takes this lightly, but what about human life?” Diane Daniels said. "This is terrifying." Diane Daniels has lived on the block for more than 30 years and said the house has been empty for at least eight years. It’s the only vacant house on what she said is a nice block. She cuts the front yard to keep the grass from hiding the raccoons at night, she said. She said that Ald. Mitchell sent someone over to board up the windows, but the animals are still able to come and go through cracks. It’s not unusual to hear them making loud noises late at night or running around in groups of three or four, Diane Daniels said. She said her plants are destroyed and a neighbor can hear the creatures on his roof. Neighbor LaTisha Murphy lives on the other side of the vacant house. A raccoon killed her kitten Simba earlier this month. Tears trickled down her face as she described the attack Monday. A call to Ald. Mitchell's office was not returned. Earl Clark lives directly across the street from the vacant house. He said he has heard animals running across his roof and even found footprints on his back porch. “They were heavier than squirrels, sounded like dogs,” Clark said. He trimmed the trees and bushes to keep them from getting on his roof again. Diane Daniels said she’s working on forming a block club so the neighborhood can unite and get the city’s attention. "This is wildlife, but I shouldn't have to live next door to it," she said. "If they attacked my neighbor's cat who or what are they going to attack next?" According to the Illinois Department of Natural Resources, raccoons "eat a wide variety of plants and animals." "Bird food, pet food and table scraps discarded by people are mainstays in urban areas," according to the department. "Animal foods include insects and crayfish, and to a lesser extent, snails, earthworms, clams, birds, fishes, frogs, and small mammals." Chicago Care and Animal Control encourages people to contact them or 311 anytime they find injured or trapped wildlife, wildlife that pose an imminent hazard to public health or safety, or wildlife in their home.